Application of biochar to soils changes soil physicochemical properties and stimulates the activities of soil microorganisms that influence soil quality and plant performance. Studying the response of soil microbial communities to biochar amendments is important for better understanding interactions of biochar with soil, as well as plants. However, the effect of biochar on soil microorganisms has received less attention than its influences on soil physicochemical properties. In this review, the following key questions are discussed: (i) how does biochar affect soil microbial activities, in particular soil carbon (C) mineralization, nutrient cycling, and enzyme activities? (ii) how do microorganisms respond to biochar amendment in contaminated soils? and (iii) what is the role of biochar as a growth promoter for soil microorganisms? Many studies have demonstrated that biochar-soil application enhances the soil microbial biomass with substantial changes in microbial community composition. Biochar amendment changes microbial habitats, directly or indirectly affects microbial metabolic activities, and modifies the soil microbial community in terms of their diversity and abundance. However, chemical properties of biochar, (especially pH and nutrient content), and physical properties such as pore size, pore volume, and specific surface area play significant roles in determining the efficacy of biochar on microbial performance as biochar provides suitable habitats for microorganisms. The mode of action of biochar leading to stimulation of microbial activities is complex and is influenced by the nature of biochar as well as soil conditions. Biochar exhibits a range of physicochemical properties depending on the type of feedstock, pyrolysis conditions, and modification techniques (such as activation, magnetic modification, and acid/base treatments) (Lou et al. 2016; Mohan et al. 2014; Rajapaksha et al. 2016). Even though the chemical and physical properties of biochar have been well studied, the biochar’s effects on the biological functions of soil is poorly understood. Understanding the impacts of biochar on soil biological functions would require long-term monitoring and investigation of changes in biological properties in biochar-amended soils. Biochar application would have complex effects on soil biological properties, including direct/indirect interactions among abiotic and biotic factors and processes in the soil (Zhu et al. 2017). Over the past couple of decades, studies have revealed that biochar-soil application could improve soil biological properties by enhancing soil microbial functional activities and altering community structure (Li et al. 2018), (Fig. 1). Moreover, biochar effects on soil biological properties as affected by other soil organisms and plants were also studied (Palansooriya et al. 2019; Paz-Ferreiro et al. 2014). Since soil microorganisms play a vital role in soil ecosystem functions and services (for example, driving biogeochemical cycles, suppressing pathogens, and maintaining soil quality and health), the next milestone of biochar research should focus on understanding the long-term impact of biochar application on soil biota together with soil health. It is necessary to explore the capacity of biochar to improve soil quality under future environmental changes (Griffiths and Philippot 2013). The soil is home to microorganisms such as bacteria, fungi, nematodes, algae, archaea, actinomycetes, bacteriophages, and protozoa (Paul 2014). These microbes are involved in many beneficial soil functions, such as nutrient recycling, organic matter decomposition, soil-structure formation, secretion of plant growth promoters, degradation of organic contaminants, and suppression of pests and diseases (Kirchman 2018). 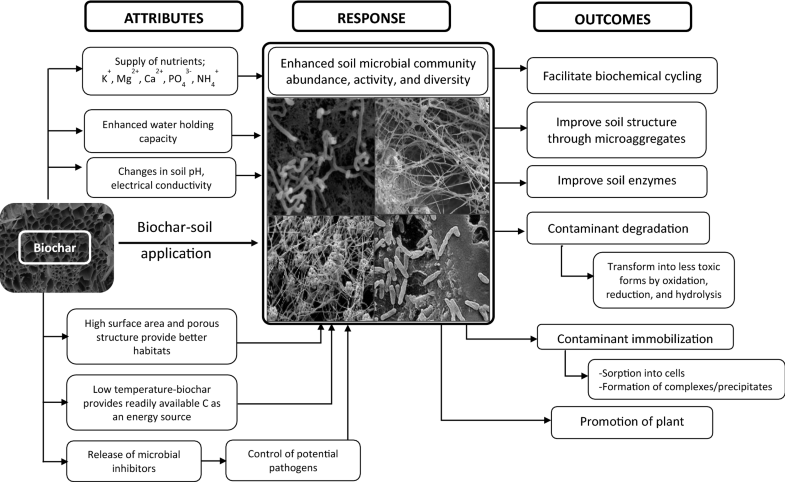 Soil microbial functional activities and community structure can be considered as useful indicators in assessing the impacts of biochar on soil biological properties. Some parameters for example, basal respiration, nitrogen (N) mineralization, N2 fixation, and enzyme (e.g., dehydrogenase) activities are used to determine microbial functional activities in the soil (Paz‐Ferreiro and Fu 2016), whereas phospholipid fatty acid (PLFA), denaturing gradient gel electrophoresis (DGGE), temperature gradient gel electrophoresis (TGGE), polymerase chain reaction (PCR), and DNA and RNA analyses are some of the useful methods for determining microbial community structure (Nannipieri et al. 2003). After the review by Lehmann et al. (2011), many studies have reported biochar-induced changes in soil microbial properties, including microbial biomass, community composition and diversity, specific functional groups, and biogeochemical processes (Awad et al. 2018; Li et al. 2018; Xu et al. 2018b). However, it is difficult to draw conclusions about the mechanisms of biochars regulating microbial structure and functions in the soil (Table 1). This is not unexpected due to the wide range of biochar properties, soil types, and experimental conditions that affect microbial properties. The physicochemical properties of biochar (Table 2) greatly impact soil biological properties following its application. For example, the increase in soil pH, dissolved organic C content, carbon-to-nitrogen ratio (C:N), and K+ concentrations in biochar-amended soils was found to alter microbial community structure in different soils (Choppala et al. 2016; Muhammad et al. 2014; Quilliam et al. 2013; Wong et al. 2019). Moreover, Farrell et al. (2013) reported that the application of biochar improved the soil labile C content and soil pH and altered soil microbial community structure. Nevertheless, the highly porous structure of biochar provides habitats for microorganisms to colonize, permitting their growth in the soil environment (Awad et al. 2018; Lehmann et al. 2011; Quilliam et al. 2013; Ye et al. 2017). However, neutral/negative impacts of biochar on soil biological properties have also been documented. For example, Elzobair et al. (2016) found that the application of biochar to an Aridisol had no effect on soil extracellular enzyme activity, microbial community structure, microbial biomass, and nor arbuscular mycorrhizal fungi root colonization. The authors suggested that biochar's effect on microbial communities largely depended on biochar application rates, biochar and soil types. The changes in microbial functions and community structure could only occur when the application rates of biochar are high enough to significantly alter soil moisture retention capacity, pH conditions, and/or nutrient concentrations, which are the most critical factors influencing microbial diversity and composition in the soil (Gomez et al. 2014). For instance, increasing biochar application rate from 0.5 to 5.0% (w/w) reduced the total PLFA content and the relative abundance of bacteria in the soil (Wang et al. 2015). Furthermore, it was suggested that smaller amounts of biochar application (0.5% (w/w)) could increase the activities of soil extracellular enzymes such as ß-D-cellobiosidase, ß-glucosidase, and N-acetyl-ß-glucosaminidase (Wang et al. 2015). Bull manure + dairy manure + Pinus spp. Soil condition plays a key role in determining microbial community composition in biochar-amended soils. For instance, Awad et al. (2018) observed lower PLFA biomass in biochar-treated soils under oxidized conditions, whereas PLFA biomass was increased when the soil was under reduced conditions. Microbial communities may not be stimulated if biochar could not provide sufficient labile C or N substrates, and if the biochar application rate is not sufficient to affect the soil pH. 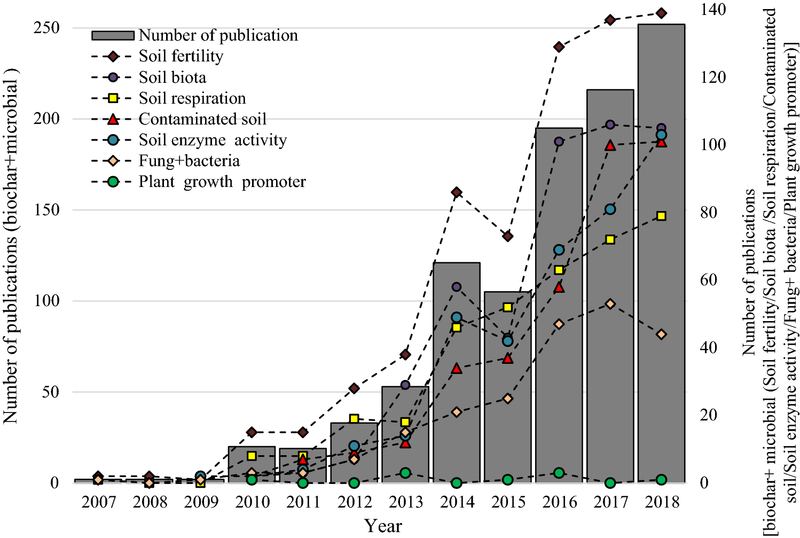 The recent increasing trend in the number of studies on biochar effects on soil biota (Fig. 2) justifies a comprehensive review on this topic and proposes much needed future research questions and directions. Despite the increasing research on biochar–microbial relationships, mechanistic studies have remained few, focusing on discerning specific roles of biochar in microbial processes in biochar-amended soils. The previous reviews have illustrated key aspects of biochar from production methods, physical and chemical characterization, to interactions with soil physicochemical properties (Jeffery et al. 2011; Lehmann et al. 2006b; Sohi et al. 2010). Biochar had been extensively applied as amendments for environmental remediation, such as removal and degradation of inorganic and organic contaminants from soil and water (Ahmad et al. 2014; Mohan et al. 2014). Nevertheless, the knowledge on the influences of biochar on soil biota has remained limited and poorly integrated. Thus, the objectives of this review are to discuss the (i) role of biochar as a growth promoter for soil microorganisms, (ii) impacts of biochar on the soil microbial activities, and (iii) responses of microbial communities to biochar amendment in contaminated soils. This review will enable us to identify research gaps in this area. Modification of soil physicochemical conditions may positively or negatively affect soil microbial community structure and functions, through altering their habitats. These changes in soil properties are the direct and primary growth promoter for soil microbes. Improvements in soil properties, such as increase in soil pH, soil–water retention capacity, and nutrient [e.g., C, N, phosphorus (P), potassium (K), magnesium (Mg), and calcium (Ca)] availability (Li et al. 2019) could promote soil microbial growth. The available nutrient composition and concentration in biochar are governed by the feedstock and production conditions, such as production temperature and retention time. In general, increase in production temperature increases biochar pH, total surface area, carbon-to-oxygen ratio (C:O), and C:N, while reducing dissolved organic matter and C contents (Crombie et al. 2013, Huff et al. 2014, Uchimiya et al. 2013). In addition, biochar also supports microbial communities by providing labile C substrates for degradation (Smith et al. 2010). In this section, we summarize the impact of physicochemical properties of biochar on soil biota. It shows some selected physicochemical properties of biochar produced under different pyrolysis temperature with different feedstock types are summarized in Table 2. The highly porous nature of biochar and its high surface area are favorable habitats for soil biota (Jaafar et al. 2014, 2015; Ye et al. 2017). The specific area and the porosity of biochar strongly depend on the type of feedstock as well as the production temperature. High temperature promotes organic matter and water volatilization during the thermal decomposition process and results in large pores (Brewer and Brown 2012). 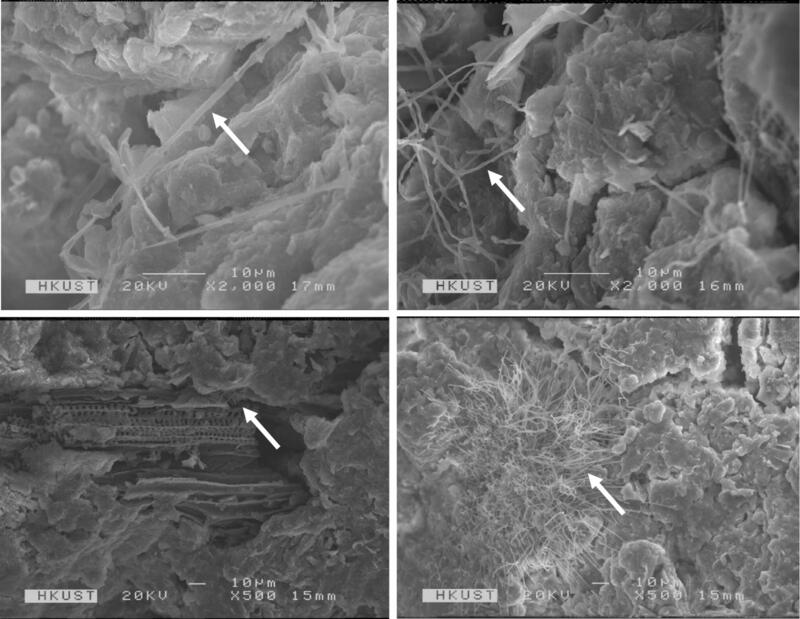 Figure 3 shows the highly porous structure of biochar through scanning electron microscopy (SEM), in which the feedstocks are mostly plant origin, and the biochars were produced at 600 °C and 850 °C. The biochar has macropores (> 200 nm), mesopores (2–50 nm), and micropores (< 2 nm), according to the IUPAC classification (Lehmann and Joseph 2015; Zhao et al. 2013). These pores serve as habitats for diverse soil biota (Jaafar et al. 2014; Pietikäinen et al. 2000; Quilliam et al. 2013; Warnock et al. 2007), such as bacteria (size within the rage of 0.3–3 mm), ectomycorrhizal fungi, ericoid mycorrhizal fungi, and arbuscular mycorrhizal fungi (AMF) (2–80 mm) (Warnock et al. 2007). Bacteria and the hyphae (< 16 µm) of different fungi colonize the biochar pores, gaining physical protection from predators (such as mites and nematodes) in the soil (Ezawa et al. 2002; Pietikäinen et al. 2000; Saito 1990). 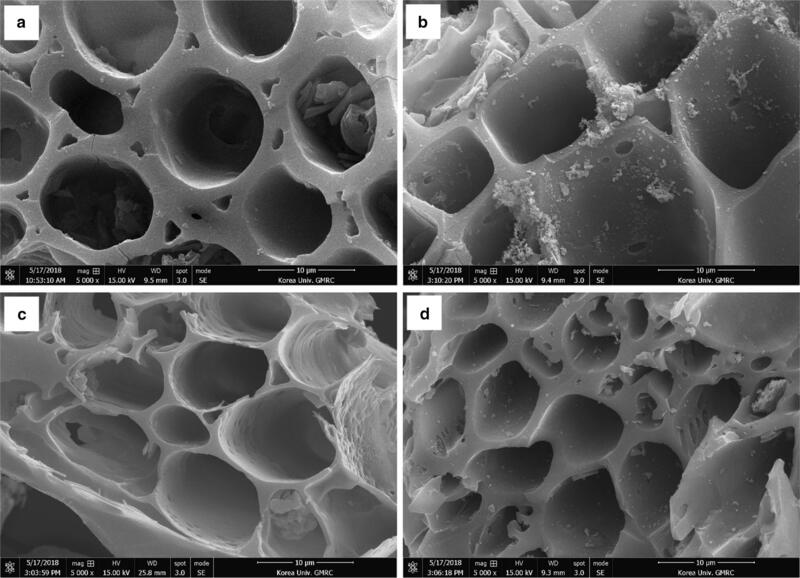 Colonization of biochar pores by AMF has also been reported (Ezawa et al. 2002; Gaur and Adholeya 2000; Saito 1990). In addition, water molecules and soluble substances (e.g., acids, alcohols, aldehydes, ketones, and sugars) involved in microbial metabolism would be stored in mesopores and micropores (Brewer and Brown 2012; Lehmann and Joseph 2015). As a result, biochar may regulate the abundance and activities of certain microbes which could take advantage of the physical properties of biochars. Surface area is another important biochar property that influences the growth of soil microbes (Jaafar et al. 2015). It is generally higher than that of the corresponding feedstock materials and also the soil. When compared with slow pyrolysis, fast pyrolysis can increase the surface area of biochar (Chintala et al. 2014a; Mohanty et al. 2013). The surface areas of soybean stover biochar produced at 300 and 700 °C were 5.61 and 420.33 m2 g−1, while pine needles biochars produced at the same temperatures showed 4.09 and 390.52 m2 g−1 of surface areas, respectively (Ahmad et al. 2016). Thus, depending on the pyrolyzing temperature and the type of feedstock, increased porosity and surface area provide a greater access for microbial colonization. Increased specific surface area and porosity of biochar are related to increased water holding capacity across different soil types, providing improved water retention for microbial activities and growth (Ahmad et al. 2014; Mohamed et al. 2016; Wong et al. 2017). An incubation study conducted with woody biochar revealed better hyphal colonization on the biochar surface via SEM (Jaafar et al. 2015). In addition, the study suggested that the enhanced surface area and the high porosity of biochar provided potential habitats for soil microorganisms (Jaafar et al. 2015), (Figure 4 shows the SEM images of fungal hyphae grown on peanut shell biochar surface). Soil chemical properties, particularly soil pH is one of the governing factors of soil microbial abundance and activity, which may be significantly modified by biochars if a sufficient amount of biochar is added to the soil (Lehmann et al. 2011). The presence of negatively charged hydroxyl, carboxyl, and phenolic groups on the surface of biochar makes them alkaline (Brewer and Brown 2012; Chintala et al. 2014b). In addition, carbonates, bicarbonates, and silicates in biochar can bind with the hydrogen ion in soil–water. It reduces the H+ concentration and, therefore, an increase in pH value (Gul et al. 2015). The alkalinity of biochar is also positively correlated with the production temperature (Gul et al. 2015) and related to the feedstock type. Therefore, biochar application usually increases soil pH (Masto et al. 2013; Stewart et al. 2013; Wong et al. 2017; Xu et al. 2014). The addition of corn straw-derived biochar increased the soil pH and electrical conductivity (EC) and decreased N leaching; as a result, changes were observed in the community composition of bacteria (Xu et al. 2016). In addition, the biochar application rate was found to be positively correlated with bacterial diversity in the biochar-amended soil (Xu et al. 2016). However, Luo et al. (2017) reported that the addition of maize straw biochar did not increase the soil pH, probably because the addition rate was inadequate to alter soil chemistry. Furthermore, Luo et al. (2017) found an increased microbial population in a sandy loam soil due to the application of bamboo stick biochar. The high pH, EC, and available K+ in biochar improved the soil properties required for microbial colonization (Chen et al. 2017a). The elevated soil nutrient contents following biochar application to soil could promote the activity/growth of soil biota. For instance, application of maize straw-derived biochar at 30 t ha−1 to a silt loam soil increased the soil organic C, total N, and total P, thus, increasing the availability of soil nutrient (Luo et al. 2017). As a result, increased relative abundance of AMF and the AMF/saprotrophic fungi ratio were observed when compared to the control (Luo et al. 2017). In fact, the application doses of biochar and soil types are important when considering the performance of soil biota in biochar-amended soils. Abujabhah et al. (2018) reported that biochar addition had a greater impact on the bacterial diversity in three different-textured soils. Furthermore, the results of that study suggested that soil type and biochar rates affect the community structure and the abundance of N-cycling bacteria in the soil (Abujabhah et al. 2018). Nevertheless, Luo et al. (2017) noted that application of high quantities of biochar has greater potential to increase fungal than bacterial diversity. Treseder and Allen (2002) found that nutrient additions by adding biochar promoted the growth of the AMF in nutrient-poor soils. In addition, biochar alters N/P ratio in soil and, therefore, the fungal root colonization rate (Miller et al. 2002). Conversely, Nie et al. (2018) found that the fungal population decreased with biochar application, which may be attributed to increased P input through biochar application (Bolan 1991). Organic amendments such as biochar and compost may alter soil systems and organic C mineralization rate (Awad et al. 2017; Cross and Sohi 2011). However, amendments such as biochar increase recalcitrant organic carbon (OC) compared to other forms of organic amendments, such as plant residues, compost, and animal manure (Kimetu and Lehmann 2010). Consequently, CO2 evolution, the primary pathway by which CO2 fixed by terrestrial plants returns to the atmosphere, can be controlled by adding biochar to soil (Cross and Sohi 2011; Meier et al. 2017b). Biochars produced by fast pyrolysis at low temperatures may result in incomplete pyrolysis of biomass and those biochars are more vulnerable to degradation (Bruun et al. 2012). Biochars produced at slow pyrolysis at high temperatures result in complete pyrolysis of biomass due to longer residence time. Thus, incompletely pyrolyzed biochars have more labile C and the utilization of labile C by soil microorganisms accelerates the biochar decomposition (Bruun et al. 2011). In contrast, completely pyrolyzed biochars have more recalcitrant C and hence resistance to microbial degradation (Bruun et al. 2011; Farrell et al. 2013). There are many benefits of biochar applications, including soil and water quality improvement, climate change mitigation, energy production, and waste management; however, initially, biochar application to the soil was intended for long-term soil C sequestration (Ahmad et al. 2014; Lehmann et al. 2006a; Wong et al. 2017). Recently, studies have highlighted the influences of biochar application on soil OC mineralization. Junna et al. (2014) noticed lower rates of OC mineralization for wheat straw biochar produced at high temperature (600 °C) than at low temperature (300 °C) and wheat straw itself. An interesting finding in this study was that adding biochar decreased wheat straw mineralization. However, this study did not reveal actual mechanisms and processes involved in this biochar-altered straw mineralization in the soil. Another short-term soil incubation study found that microbial respiration as indicated by CO2 emission was increased by adding switchgrass biochar pyrolyzed at 500 °C to the soil, which was attributed to the increased amounts of readily available C for microorganisms as a short-term energy source (early stage of incubation) (Hawthorne et al. 2017; Smith et al. 2010). Interestingly, Pokharel and Chang (Pokharel and Chang 2019) found that biochars produced from manure pellet and woodchip have different effects on CO2 emission from bulk and rhizosphere soils. As bulk soil alone may result in incorrect conclusions about the impact of biochar on soil processes, care should be taken when using different types of biochar in different soils. Long-term biochar application may lead to enhanced C storage in the soil as the complex aromatic and aliphatic compounds are resistant to microbial degradation (Novak et al. 2010; Smith et al. 2010). In relation to this, Xu et al. (2018a) documented that there is a negative priming effect and no obvious C mineralization in biochar-amended soils in some cases. These reported findings imply that the application of biochar would have altered microbial functions and associated metabolisms of OC mineralization in the biochar-amended soil, due to biochar-induced changes in physicochemical properties of the soil. Biochar interacts with native soil organic matter (SOM) in a complex way; biochar may either have a positive or negative priming effect or have no effect on native SOM. This depends upon the feedstock type, pyrolysis temperature, and organic matter level of soil. The soils richer in organic matter status provide positive priming effect of native SOM due to biochar addition and vice versa (Wang et al. 2016). Biochar has high C sequestration potential and long-term influence on native SOM. One of the impacts of biochar on the soil is its influence on bioavailable moisture dynamics in wetting–drying cycles of the amended soil. Due to the high porosity and surface area, the increased water availability may favor the survival of microbes during dry periods by providing a better habitat, leading to enhanced microbial activities and respiration (Johnson et al. 2017; Junna et al. 2014). Reduced microbial respiration was observed during the dry period, owing to limited nutrients’ availability and the inactivation or death of microorganisms (Junna et al. 2014). Conversely, increased respiration upon rewetting was explained by the greater availability of substrates/nutrients and reduced diffusive limitations for substrates, resulting in the activation of microorganisms and the subsequent utilization of the readily available C (Junna et al. 2014; Rahman et al. 2018). It is important to identify the biochar’s effect on gaseous losses of N from soil as there are many environmental impacts due to the NH3 and N2O emissions. For instance, Thangarajan et al. (2018) recently examined the effect of biochar and dicyandiamide (DCD, a chemical nitrification inhibitor), on N transformation and N losses in soils treated with organic amendments. The results showed 75% reduction in N2O emission by DCD treatment while increasing NH3 emission. However, biochar exhibited 23 and 43% reduction in N2O and NH3 emissions from the soils, respectively. These findings indicate the potential of biochar to minimize N losses caused from NH3 volatilization and N2O emission. Many biogeochemical processes in the soil are facilitated or catalyzed by soil microorganisms via secreted extracellular and/or intracellular enzymes (Sabale et al. 2015). 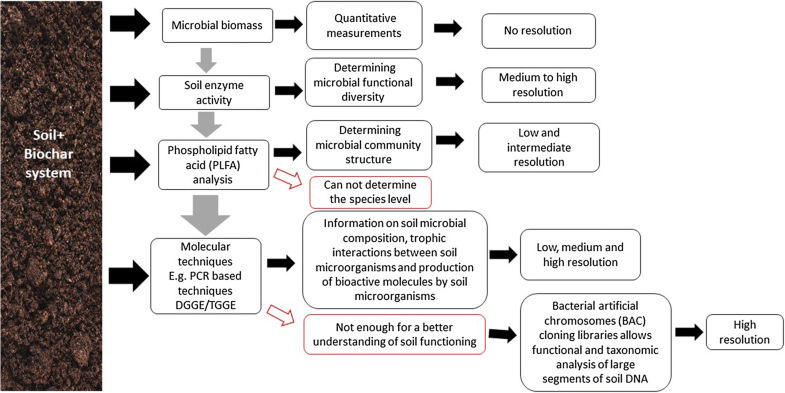 Soil enzymes are important indicators of soil quality as they are directly associated with microbial activity and biogeochemical cycling of nutrients (Ahmad et al. 2012; Das and Varma 2010; Hashimoto et al. 2009). Degraded soil quality may be restored by biochar amendments through improving soil biological properties, such as enhancing enzyme activity. For instance, evaluation of changes in dehydrogenase activity in biochar-amended/unamended soils is a good indicator for the evaluation of degree of recovery of degraded soils (Demisie et al. 2014). Increased dehydrogenase activities in biochar-amended soils were observed with different types of biochar under different soil conditions (Bhaduri et al. 2016; Irfan et al. 2019; Mierzwa-Hersztek et al. 2016). The enhanced dehydrogenase activities in biochar-treated soils can be attributed to the addition of labile organic matter and the high content on volatile matter of the used biochars (Gascó et al. 2016). A fluvo-aquic soil amended with biochar increased the activity of some extracellular enzymes (such as ß-glucosidase, ß-D-cellobiosidase, ß-xylosidase, and a-glucosidase, and sulfatase) involved in soil C and sulfur (S) cycling (Wang et al. 2015). However, this effect seemed inconsistent and was depended on the rate of biochar addition. For example, low rate of maize biochar application (0.5% [(w/w]) elevated the enzyme activity in the soil, whereas higher rates of maize biochar application (1.0, 2.5, and 5.0% [w/w]) lowered the enzyme activity (Wang et al. 2015). Furthermore, Demisie et al. (2014) found that dehydrogenase activity in a degraded red soil was elevated by the application of oak wood and bamboo biochar at 0.5% (w/w). In their study, β-glucosidase activity was observed to be increased only in the soil amended with bamboo biochar at 0.5 and 1.0%. Moreover, urease activity was increased in soil amended with oak wood biochar (0.5 and 2.0%) and bamboo biochar (0.5%) at different application rates (Demisie et al. 2014). However, it remains to be investigated as to how biochar regulates soil enzyme activities and what processes are involved in this interaction. Teutscherova et al. (2018) reported that liming effect of biochar reduced Al toxicity in degraded acidic soils, which was accompanied by increased dehydrogenase activities. However, decreased β-glucosidase, β-glucosaminidase, and phosphatase activities were observed for biochar-amended Acrisol (Teutscherova et al. 2018). This can be attributed to the adsorption of enzymes on biochar surfaces making them unavailable for enzyme activities, for instance, > 99% of β-glucosidase was adsorbed by chestnut wood biochar surface (Lammirato et al. 2011). The study concluded that low specific surface area and low porosity of biochar would be helpful to maintain an active and protected enzyme pool in soils (Lammirato et al. 2011). However, it is difficult to draw a conclusion about causal relationship between biochars and soil enzyme activities, due to the wide range of biochars, soil conditions, and soil enzymes in the soil environment (Table 1). The net effects of biochars on soil enzyme activities can be indirect (e.g., microbial synthesis) and direct (e.g., surface adsorption). Despite the beneficial role of microorganism in the soil, soil-borne pathogens can adversely affect plant growth. Jaiswal et al. (2018) revealed that biochar could immobilize and deactivate enzymes which degraded cell walls and detoxify metabolites produced by Fusarium oxysporum f. sp. radicis lycopersici and, thus, protect crop plants against soil pathogens. In general, these studies showed that soil enzyme activity in biochar-amended soils was dependent on the chemical composition of biochar, biochar application rate, type of soil, and the nature of soil enzymes (Fig. 1). Soil microbial community structure in biochar-amended soils has been studied with low, moderate-to-high-resolution techniques including PLFA, qPCR, DGGE, TGGE, and DNA and RNA analyses (Fig. 5). A biochar-treated acid soil was evaluated for soil microbial communities by PLFA; where increased PLFA was observed compared to the control soil after 431 days of incubation (Luo et al. 2018). It has been demonstrated that higher surface area of biochar could adsorb water, nutrients, and soluble C which in turn facilitate the microbial colonization (Luo et al. 2018). Moreover, the PLFA revealed that Gram-positive bacteria used biochar C as substrate from the biochar produced at 350 °C than that at 700 °C. Thus, the study suggested that the pyrolysis temperature of biochar is an important factor controlling the microbial community structure in soils regardless of the soil pH (Luo et al. 2018). In contrast, several other studies have observed a decrease in PLFA contents following the biochar application into soils (Ameloot et al. 2014; Gomez et al. 2014). As shown by Wang et al. (2015), the relative abundances of fungi and bacteria, and the PLFA contents were decreased with increasing application rate of maize biochar. This can be explained by the alkalinity nature of biochar that tends to inhibit soil microbial activity in the short term and thereby reduce the community composition. As soil pH is a key determinant of microbial community structure and the evolution of certain functional groups (Cheng et al. 2013; Lauber et al. 2009), it is not surprising to have observed biochar amendments altered soil microbial community structure and functions in the literature. Gomez et al. (2014) noticed a reduction in PLFA concentrations in three different soils with increasing application rate of biochar. The authors cautioned that higher loading rates of biochar could modify the soil structural properties and added toxic compounds can negatively affect soil microorganisms. However, this negative effect may also depend on the soil condition. As revealed by Awad et al. (2018), application of biochar reduced the total biomass measured using the PLFA analysis at high redox potential, while increased total PLFA biomass resulted in a low redox potential. The decreased available C at higher redox potential and the increased pH were responsible for these biomass changes (Awad et al. 2018). Changes in microbial community composition can be further studied using high-resolution techniques under different soil conditions using various biochar types. Biochar-treated paddy soils were evaluated for bacterial and fungal community structure and abundance using 16S rRNA and 18S rRNA gene, which were characterized using terminal-restriction fragment length polymorphism (T-RFLP) combined with clone library analysis, DGGE and qPCR assay (Chen et al. 2013). The study found that gene copy numbers of bacterial 16S rRNA were increased, while that of fungal 18S rRNA was decreased with biochar amendments. Moreover, DGGE bands of fungal 18S rRNA gene revealed that higher application rate (40 t ha−1) of biochar resulted in inhibiting some bands associated with Ascomycota and Glomeromycota. The study concluded that increased soil pH and improved soil fertility might have supported to increase the diversity of the bacterial community, whereas highly stable organic C of biochar restricts the availability of substrate for the fungi for their metabolism (Chen et al. 2013). To identify the change of bacterial diversity and community structure, DNA extraction, PCR amplification of 16S rRNA gene fragments, and DNA sequencing were done in a biochar-treated soil (Xu et al. 2016). The study revealed that bacterial diversity increased with the increasing biochar application rate. However, the relative abundance of some phyla was decreased, while some others were increased. These different observations in the above studies could be attributed to several factors. Microorganisms which have the ability to degrade recalcitrant C compounds are likely to be predominant in biochar-amended soils (Kirby 2005; O’neill et al. 2009). Moreover, acidophilic microorganism, for example the bacteria phylum Acidobacteria, tends to be diminished due to the increasing alkalinity with biochar amendments (Mao et al. 2012). Nevertheless, increase of soil moisture following the application of biochar tended to decrease some microorganisms such as Gemmatimonadetes as they prefer dry soil conditions (DeBruyn et al. 2011). The above results of various studies have shown that biochar has a potential to change the microbial community structure in various degrees as a function of time, soil condition, and the type of biochar. Many studies have demonstrated that biochar incorporation into the soil can help to reduce the availability of various contaminants in the soil. It is well known that biochar has the capacity to immobilize organic/inorganic contaminants in soils via various mechanisms such as complexation, sorption, precipitation, co-precipitation, and ion exchange. Those processes alter soil chemical properties in biochar-amended soils (Ahmad et al. 2014; Mohan et al. 2014). Yet, it has been largely unknown if biochar improves or retards the biological activity in contaminated soils. Thus, it is important to identify the response of soil microorganisms to biochar amendments in contaminated soils, which is summarized in Table 3. Biochar may indirectly affect soil microbial community structure and functions in heavy-metal-contaminated soils, since heavy-metal toxicity may suppress or inhibit soil microbial growth and alter soil microbial community structure (Xu et al. 2018b). For instance, Hu et al. (2014) revealed negative correlations between total and available heavy metals and microbial biomass carbon/nitrogen/MBN. Metal immobilization also contributes to the reduction of bioavailable heavy metals by the presence of ample O-containing functional groups on biochar surfaces (Abdelhafez et al. 2014). Nie et al. (2018) performed a field experiment in a soil contaminated with Cu, Cd, and Pb to examine the effects of biochar on availability of heavy-metal and soil microbial activity. Application of sugarcane bagasse-derived biochar at a rate of 3.0 t ha−1 increased soil bacterial population by 2.8 times, compared to the control (Nie et al. 2018). However, the fungi population was reduced, suggesting negative effects of biochar application on fungal colonization. Prayogo et al. (2014) observed that biochar amendment increased the population of Gram-negative bacteria and actinomycetes in soil. Chen et al. (2013) discovered that wheat straw biochar diminished the fungal gene abundance while changing community structure of fungi. The contrasting effects of biochar on bacteria and fungi might be caused by the high levels of mineral elements and the organic compounds in biochar (Lehmann et al. 2011), and the increase in soil pH (Chen et al. 2013). Furthermore, the sorption of organic C and organically bound nutrients on biochar may hinder soil microbial growth (Elzobair et al. 2016). Cui et al. (2013) also reported that heavy metals (Pb and Cd) in soil alter diversity, activities, and population size of microorganisms. Biochar application alters soil pH and reduced the heavy-metal bioavailability. It increased the population of actinomycetes and fungi by 39 and 930%, respectively, when compared with the control. A soil contaminated with Cd and Pb reduces the total PLFA concentration to a greater extent compared to the uncontaminated soils indicating the metal toxicity on soil microorganism (Xu et al. 2018b). However, application of biochar alleviated the metal toxicity in soil while increasing the PLFA concentration which shows the reduced metal toxicity and enhanced soil microbial community composition as affected by biochar application. Application of vegetable waste biochar produced at 200 °C improved the soil quality of heavy-metal-contaminated soils, through increasing soil microbial abundance and associated microbial activities which were proven by dehydrogenase activity and fatty acid methyl ester (FAME) analysis (Igalavithana et al. 2017a; Meier et al. 2017b). In contrast, Igalavithana et al. (2017b) reported that the application of umbrella tree (Maesopsis eminii)-derived biochar to a heavy-metal-contaminated soil had no effect on microbial abundance determined by FAME analysis and dehydrogenase activity in a short term. The low surface area and low volatile matter content of the resultant biochars reduced the microbial community and the activity in the soils amended with biochars (Igalavithana et al. 2017b). Elevated metal concentrations in soils can disrupt microbial functions, resulting in adverse effects on the ecosystem. Therefore, improving soil microbial performance with amendments such as biochar would positively affect the overall ecosystem health. Mandal et al. (2017) observed that application of manure biochar enhanced Cr(VI) reduction in Cr(VI)-spiked soil. Stimulation of the soil microbial community with the addition of biochar assisted the conversion of Cr(VI) into less toxic Cr(III). This was mainly due to the provision of C and protons to support microbial activities in the soil (Ahmad et al. 2014; Choppala et al. 2012; Herath et al. 2017; Mandal et al. 2017; Xia et al. 2019). Moreover, chicken manure-derived biochar was used in a Cu-contaminated soil to reduce Cu bioavailability successfully and increase microbial activity in the soil because of the storage of Cu in metal-tolerant structures of the soil microbes (Meier et al. 2017a). Ahmad et al. (2016) observed that biochar produced at a low temperature could increase the abundance of fungi, Gram-positive, and Gram-negative bacteria, actinobacteria, and actinomycetes in a Pb- and As-contaminated soil. As a result, the capacity of biochar to change the soil pH, organic matter content, and available nutrients has a great impact on soil microbial activity in contaminated soils amended with biochar (Beesley et al. 2010, 2011; Huang et al. 2017). A PCR-DGGE-based analysis was used to elucidate the effect of biochar on indigenous microbial community composition in a heavy-metal-contaminated sediment (Liu et al. 2018). As reveled by the 16S rRNA sequencing analysis, biochar application adversely affected the performance of indigenous microorganism, resulting in reduced abundance and diversity. Although the biochar caused to disappear some bacteria species, the appearance of new bacteria species and genera was observed. The study concluded that, although the biochar caused to reduce the metal toxicity to the sediment microorganisms, biochar could modify the sediment’s physicochemical properties, which may negatively affect the indigenous microorganisms. Chen et al. (2017b) carried out an experiment to assess the effect of biochar on diversity of bacterial community in river sediment contaminated with heavy metals. As seen in amplified 16S rDNA fragments in DGGE profile, application of biochar decreased the number of bands in DGGE profile at the early stage of the experiment (1–5 days) indicating the reduced bacterial community. However, the bands were significantly increased at the later stages (7–50 days). The reduced bacterial communities at the early stages can be attributed to the accelerated microbial succession caused by biochar-induced microbial activities and growth. As a result, the dominant microbes may occupy the space and consume the nutrients rapidly which lead to inhibit the other microorganism (Huang et al. 2017). On the other hand, reduction of metal toxicity caused by biochar and the changes in environmental conditions over the time could account for the increased bacterial community at the later stages (Chen et al. 2017b). In addition to inorganic contaminants, organic contaminants such as polychlorinated biphenyl (PCB), polycyclic aromatic hydrocarbons (PAHs), organochlorides, and nitroaromatic compounds are often found in soil environments. Biochar can also be used to remediate these organic contaminated soils, resulting in their reduced toxicity, mobility, and bioavailability, which was attributed to microbial activity primed/regulated by biochar application (Beesley et al. 2010, 2011). Rhodes et al. (2010) observed a > 99% reduction of phenanthrene in a contaminated soil with 0.1% activated biochar amendment as biochar addition accelerated microbial mineralization of phenanthrene and, thus, its detoxification in the soil. In addition, microbial-assisted degradation of chlorpyrifos and carbofuran was observed in spring onion-cultivated soil amended with Eucalyptus spp.-derived biochar (Yu et al. 2009). These effects may be explained by the increased microbial biomass because of increased supply of nutrients and available organic compounds by biochar, which are readily available energy sources for soil microorganisms. Other studies also found that amendment of hardwood-derived biochar significantly decreased PAH concentrations in the soil, resulting in > 50% reduction of the heavier 4- and 5-ringed PAHs and a > 40% reduction of the lighter 2- and 3-ringed PAHs, as compared with the control (Beesley et al. 2010). In fact, the changed physicochemical properties of biochar were responsible for the reduction of a large proportion of PAHs in the soil. However, microbial degradation was also involved because of the stimulation of microbial activity by biochar. Most studies have evaluated the potential value of biochar application in improving the soil productivity in relation to altering soil physicochemical properties. It is also important to examine the value of this C rich material in improving soil health through its effects on microbial diversity and functions. Depending on the biochar type as well as the soil type and the composition of microorganisms, microbial interactions with soil and plants may largely vary. Therefore, studying the interactions of microorganisms with various types of biochar, different biochar application rates, and different plant species over the long term is required to assess the magnitude of biochar effects on soil microorganisms over time, under different conditions. Studies on biochar and microbial activities and interactions in soils have so far been mainly focused on small-scale laboratory incubation and greenhouse pot experiments. It is recommended to conduct large-scale field trials to investigate the long-term soil and plant interactions with microbes as impacted by biochar application with temporal changes in such long-term studies. Current research on biochar and their effects on soil microbial community structure, especially in contaminated soils, is mostly empirical. Biochars with different physicochemical properties and application rates were added to different soil types (soil texture and parent material). The soil microbial community or enzymatic activities were then measured after a certain period. The major limitation of this approach is that the mechanisms for the expected outcome are unknown. 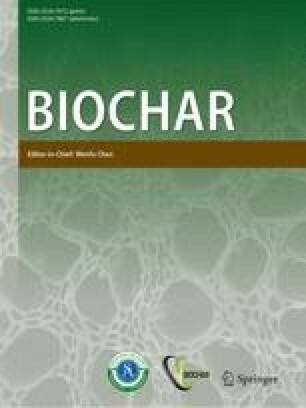 Further research using biochar as a growth promotor of specific soil microorganisms to achieve a desired goal (such as to promote soil nutrient cycling) should use a customized biochar (proactively select biochar feedstock and production conditions) based on this review and the greater literature. Many studies have shown that remediation of inorganic/organic contaminated soils with biochar application is effective. Only a few studies have investigated the changes in microbial community and activity in soils after biochar application. It is important to understand what specific microorganisms are involved in remediation of soils and the underlining mechanisms. Biochar is often applied alone in soil as an amendment. In fact, biochar possesses a distinct and highly porous structure with different pore sizes. Different soil microorganisms including bacteria and fungi can be inoculated in biochar beforehand. It does not only increase the colonization rate of desired groups of soil microbes, but also speed up the presence of their beneficial effects in biochar amended soils, especially for cleaning up soils contaminated with different pollutants. Thus, the value of biochar as a microbial carrier in crop production systems to improve soil health and productivity needs to be examined. It is difficult to isolate the impacts of biochar either on a specific soil biological property or a specific soil microbe in a microbial community. Sophisticated and cutting-edge analytical techniques such as the fluorescence in situ hybridization (FISH) (Hubert et al. 2016, Rice et al. 2016) and nanoscale secondary ion mass spectrometry (NanoSIMs) can be adopted to help advancing the scientific knowledge in this aspect. Adopting high-resolution molecular based techniques such as PLFA, PCR, DGGE, TGGE, and DNA and RNA analyses is needed for detecting families, genera, or even species level, which will be useful for better understanding microbial community structure in biochar-amended soils.